The Kennebago Lake and Kennebago River are the largest body of water designated as Fly Fishing Only east of the Mississippi. The lake is 5 miles long, 3/4 mile wide and 119 feet deep. It holds large populations of native brook trout, landlocked salmon and a smaller population of brown trout. The Upper Kennebago River and the Logan have 11 pools on the upper river formed by long shallow runs that drop into deep pools. Native brook trout in the 10 to 14 inch range are consistently caught here even during the summer months. The lower section of the Kennebago River has 30 pools to choose from containing trout and salmon. It offers 6 miles of free standing granite boulders and pool fishing. 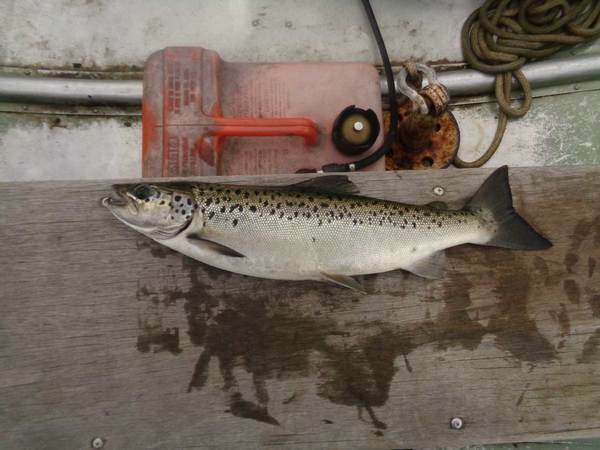 There have been salmon up to 8lbs caught along with 5lb brook trout in the Kennebago Waterway. Of course, the average is somewhat less……but read on for the where and how to get a chance at one of these trophies. The fishery in the Kennebago Region is best known for native brook trout , landlocked salmon and the occasional brown trout. Trophy salmon up to to 8 pounds are caught, but the average of 16 to 18 inches is more common and three pound fish are not uncommon. Native brook trout up to 5 pounds are caught with brookies in the 10- to 14-inch range more the average. Plenty of 2- to 3-pound brook trout are caught as well. Good fishermen can hook up to 20 fish or more per day. The average angler can expect to catch native brook trout consistently in the lake and river even during the summer months. Landlocked salmon are caught more sporadically, but are readily available in the right locations throughout the season. 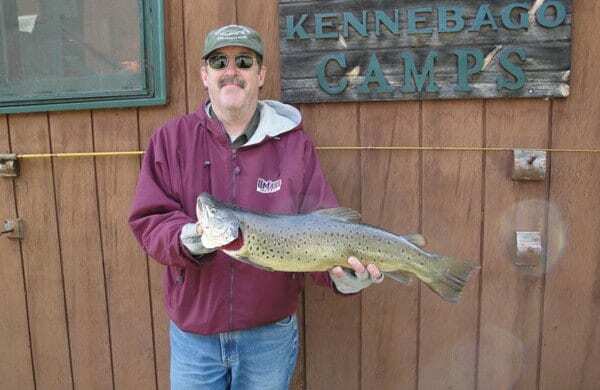 One of the best ways to experience fishing Kennebago Lake is to stay at a sporting camp such as Grants Kennebago Camps. Grants Kennebago Camps is a 100+ year old traditional Maine sporting camp located on Kennebago Lake, 9 miles behind a controlled gate in Oquossuc, near the Rangeley Lakes Region. Lakeside cabins at Grant's Kennebago Camps - life doesn't get much better than this! Fisherman need permission to pass through the gate either from Grant’s Camps or local land owners to access Kennebago Lake and Kennebago River. Grant’s cabins are steps away from the lake and all have their own docks with boats available. They also have a wood stove, electric heat, private bathrooms and showers. The cabins also have separate bedrooms, and lakeside screened in porches. In addition, your stay includes 3 home cooked meals a day with housekeeping services including linens, clean towels daily and ice delivery. If you will be out all day, let your waitress know the night before you plan to go and they will have a picnic lunch packed and ready for you. Grant’s is a remote, quiet, traditional fishing camp with up to 40-50 guests (usually about 1/2 are anglers) at maximum occupancy. The fishing is excellent, the food is great, and you can hear loons calling from across the lake and smell dinner cooking when you return to camp from a day of fishing. Fish the ledges, the shallows or the mouths of Big Sag, Flat Iron Brook or Norton Brook. Many a trout and salmon have been caught right off the docks in front of the camps. Access here can be difficult unless you wish to walk past the gate and one would be best served by arranging accommodations at Grant's Kennebago Camps. The upper river meanders down from Kennebago Lake into what is known as the Logan. The Logan is is also easily reached by boat from Grant’s Camps. It is located just the other side of the causeway where the Upper Kennebago River meets the outlet of the lake. There are 11 pools on the upper river formed by long shallow runs that drop into deep pools where native brook trout hold up to feed. Much of this water can be comfortably waded most of the year. The lower river is the place to look to as a source for larger fish, and it's heavier flow of water is accessible to the wade fisherman reachable by walking in to Indian Rock or Steep Bank Pool. Another pool in close proximity to Grant's is called Lunch Pool. The section of the Kennebago River located within our gate has 30 pools to choose from containing trout and salmon and is just minutes from camp. It offers 6 miles of free standing granite boulders and pool fishing. Spring fishing is the best time to catch easy, hungry trout with fish being caught pretty much everywhere into July depending on conditions. Late July and August one will need to look for the numerous deep holes and springs that funnel cooler water into the lake and river where fish stack up when the surface water is warmer. Fall fishing starts in September and runs through October with bigger Trout and Salmon in evidence as the surface water cools and the fish start to move. After the ice leaves Kennebago Lake in early May, smelt or small baitfish imitations seem to be the preferred patterns with Hendrickson hatches on warmer days, after 1:00 pm. Red Fox Hornbergs, Black Leech and Dragonfly nymphs are particularly productive early in the season. By the first week of June, Black Ghost, Black Nose Dace, Nine-Three or Herb Johnson in smaller sizes – 8’s and 10’s seem to produce well. As the water warms dry fly fisherman will find plenty of fish in the shallows of the Logans. The Red Quill and Blue Dun are the first major hatch on Kennebago. Toward the middle of June, begins the Green and Brown Drake hatch. Wulff patterns work well during this period. The large Green Drake hatch usually last up to four weeks. Terrestrial imitations are also effective. As the water temperatures heat up the bigger fish head for deeper water. During these times fish Crayfish, Leech and minnow imitations along the rocky bottom. In late August and early September , wet fly and streamer fishing with high D line will yield fine brook trout catches. Try a Black Ghost or yellow wiggle. The Logans and the Upper River are fished best after a late August or early September rain using a Mickey Finn bucktail or Kennebago Muddler (#10s) for fall trout. The lower Kennebago starts at the base of Big Falls. The spring salmon begin migrating up the river from Mooselookmeguntic Lake by mid-June. Wulffs, Black Ghost, Grey Ghosts and Red Fox Hornbergs work well during this early period. Toward the end of June and during the warmer months of July and August stones, light cahills, terrestials and midges work well. Fall run salmon in late August and early September prefer streamer patterns such as Colonel Bates and Black or Grey Ghosts. Light to medium tackle is best. Fly lines used vary with the time of the year. Floating, sinking tip, and sinking all in use. A 5/6-wt rod, 5x tapered leader, 4x to 6x tippet. Although I have had Salmon in the lake break off several of my flies on the take with a 4x tippet. Bring your waders, vests, net and other favorite accouterments. In-house tied flies are for sale in the office with line, leader, tippet and other accessories available. There are a number of area camps, guide services and fly shops that can provide Kennebago Lake and Kennebago River fly fishing reports. A few to check out are listed below. The Kennebago River is closed to fishing from September 30 to April 1, while Kennebago Lake is open until October 31. Kennebago Lake and River are managed under Fly Fishing Only special regulations by the Maine Department of Inland Fisheries and Wildlife. A Maine fishing license is required to to fish Kennebago Lake and Kennebago River. Fishing licenses are available for purchase in the office every day of the week including Resident and Non-Resident licenses available for one, two, three day and yearly. The nearest airport to Kennebago Lake is Portland International Jetport in Portland, ME. Lodging is available at Grant’s Kenn​​ebago Camps located right on Kennebago Lake (138 Grants Camps Ln, Rangeley, ME 04970.) Call or email for reservations (1-800-633-4815, grantscamps@gmail.com). Plan in advance since reservations fill up fast, especially for early spring right after ice out. Looking for more places to fish? Visit our DIY Guide to the Best Fly Fishing in Maine.